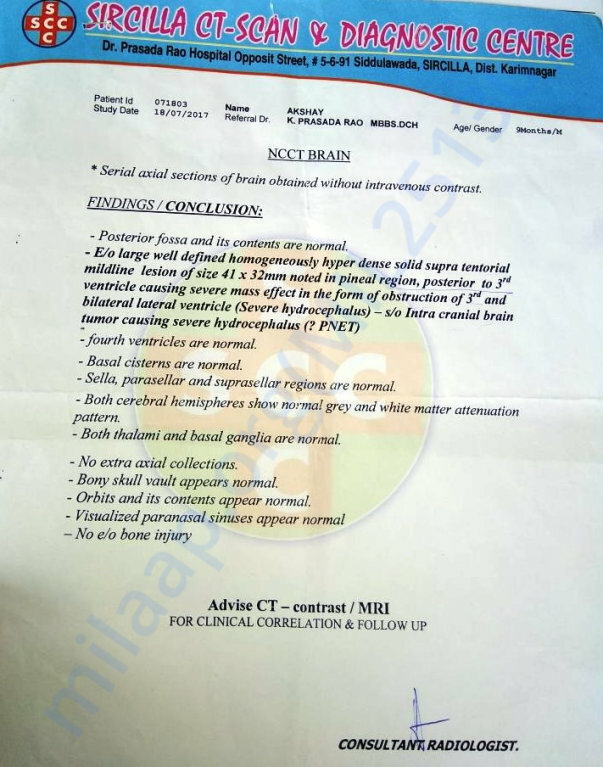 The parents are so poor and innocent and they cannot even understand what is the issue and what has to be done and cannot communicate their pain and medical details to others. They just have Love for the kid and tears to pray the GOD. As a parents they cannot watch the kid suffer and die. They don’t have money for the treatment except a hope to pray the GOD and making promises to GOD that they will visit temples if HE can cure it. The 11 month boy doesn’t know why his mother and father are always in tears. Muscles in the baby's arms and legs may be stiff and prone to contractions. Some of the developmental stages may be delayed, such as sitting up or crawling. Tense fontanel - the soft spot on the top of the baby's head bulges outward. The baby may be irritable and/or drowsy. The baby may be unwilling to bend or move their neck or head. The baby may feed poorly. The baby's head seems larger than it should be. The baby's scalp is thin and shiny. There may be visible veins on the scalp. The pupils of the baby's eyes may be close to the bottom of the eyelid; sometimes known as "the setting sun." There may be a high-pitched cry. 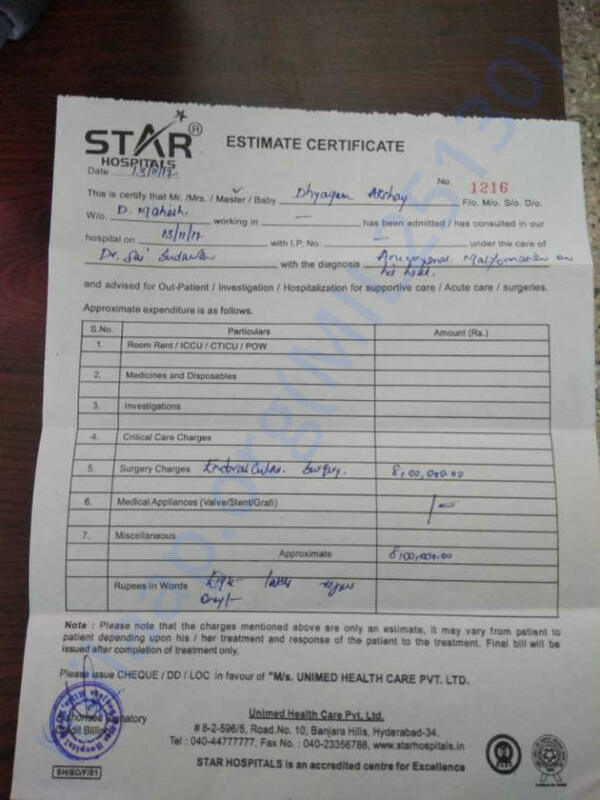 STAR Hospital in HYDERABAD confirmed Akshay condition is critical and need to start the treatment immediately and they gave an estimate of 8 lakhs(8,00,000INR) for the treatment to give a hope to parents and bring back life to Akshay. NEVER WORRY ABOUT NUMBERS. HELP ONE PERSON AT A TIME AND SHARE TO YOUR COLLEAGUES,FRIENDS, WELLWISHERS,FAMILY. 2. Now click on the 'Donate Now' tab. 3. Complete the donation amount, your name and email ID and click on the 'continue' tab. 4. Choose payment options Debit / Credit Card or Net Banking and click on the 'Continue' tab. Thank you for the support you have shown Akshay. 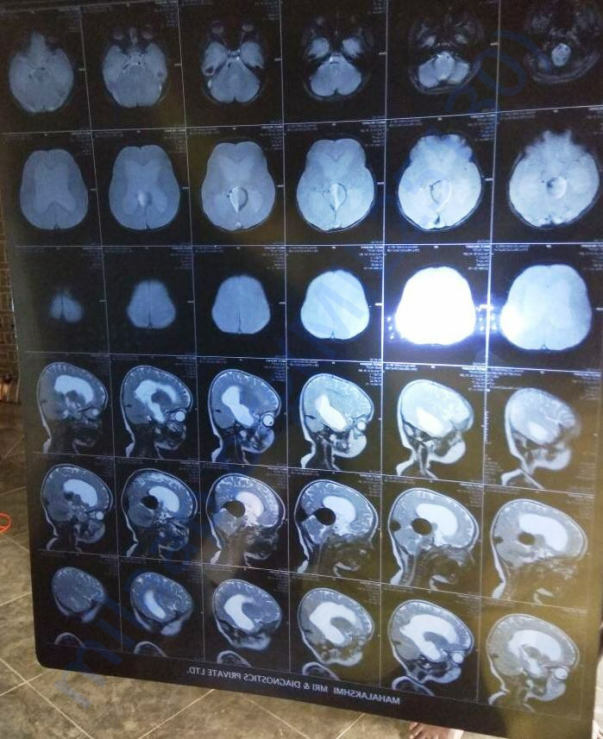 He underwent the surgery and is doing Good. He may need one more surgery within a month time to cure the issue completely. I will keep you updated on the health condition. Once again Thanks for coming forward to the give a life to the little one. May GOD bless you and your family with never ending happiness and success. I want to extend my sincere gratitude for your help and compassion towards suffering and pain of Akshay. I pray to GOD for all of you and I am sure your kind nature will be reciprocated with a lot of success and happiness in your life. 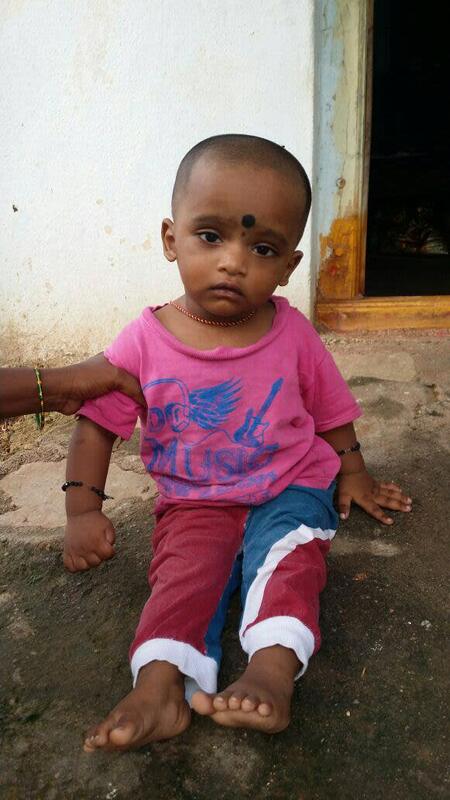 Your generous support and warm blessing will have a major impact on Akshay Life, you gave his life back. 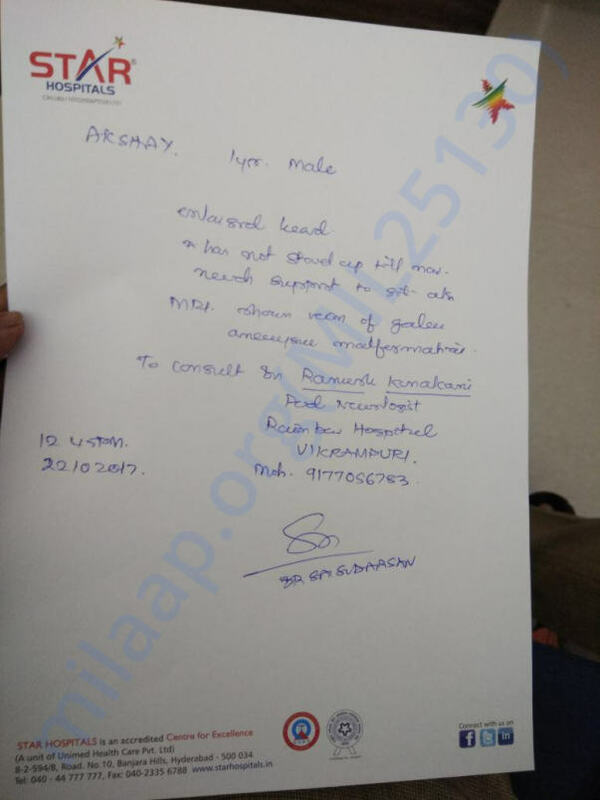 We have planned for the surgery this week and the kid's parents were about to travel to Hyderabad but Akshay had a fever last week and as per the doctor's suggestion, the surgery will be scheduled when he becomes normal. We don't want to delay and trying for Surgeon Appointment before the end of this week. 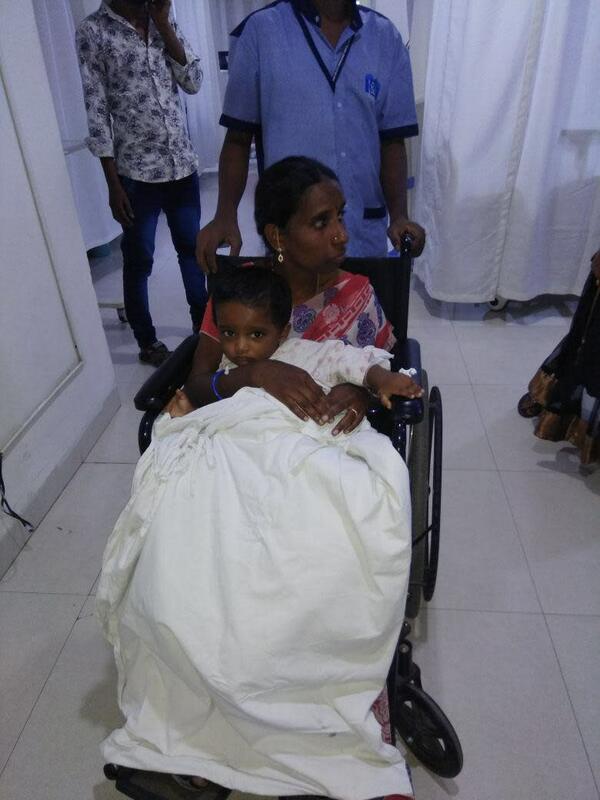 I will keep you posted with the updates, please do pray for the little one to get a ray of hope to live and recover faster. On behalf of Akshay Family and Friends, I want to thank you for the help and we all pray GOD to give lots of love and Success to all of you. Thanks to all the Supporters. May GOD bless you all happiness to you and family. 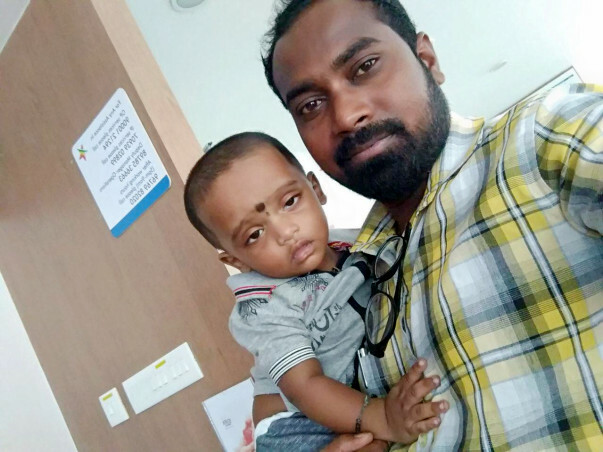 Yesterday the baby came for the consultation in STAR hospital, he was Drowsy and we can see he is fighting inside and on the Left side, back of the Ear the Nerve got enlarged which is due to the medical condition. His head looks enlarged. We saw parents are worried and could not control their tears. His parents got Akshay in their life after 6 years of marriage. so He is a precious gift to them which they don't want to lose. The doctor has referred to the Rainbow Hospital for further consultation before undergoing the surgery. 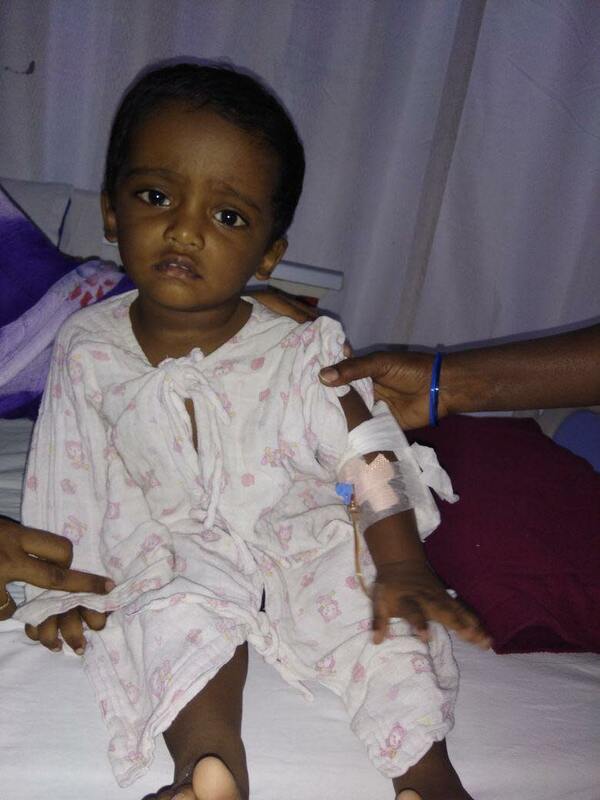 Akshay was very weak but we all felt GOD should give one chance to survive. A BIG THANK YOU! To all of you who supported us when we needed it the most, by means of your Prayers and financially. We have a long way to reach the funds. Kindly share the campaign as much as possible, every penny is worth to save a life of an innocent child. GOD will definitely give you the best in your life to you and your family.